In previous posts I mentioned that you can download basic football stats from Football-Data.co.uk. However, this data doesn’t include much detail in terms of match analysis. In other words, it doesn’t tell you about performance. So where do you go if you want to check head-to-head data items such as ‘shot accuracy’, ‘total forward passes’ or ‘errors leading to a goal’? You might have heard of Squawka already. Personally, I’ve only recently stumbled across their free football stats section. The depth of Squawka’s stats, accompanied by a neat user interface, makes football data analysis quick and easy. Who performed better out of Christian Eriksen and Mesut Ozil? The answer to the last question was Eriksen. Obviously. They both scored 8 goals apiece during the 2016/17 season. Interestingly, Eriksen took 3.33 times as many shots as Ozil. He also claimed 1.66 times more assists which is, ironically, what Ozil is famed for doing himself. Where Ozil excelled was his superior possession score — which was 3.58 times higher than Eriksen’s. Squawka rated Eriksen higher than Ozil overall. However, there’s a strong suggestion that these two players serve different roles in their respective teams. 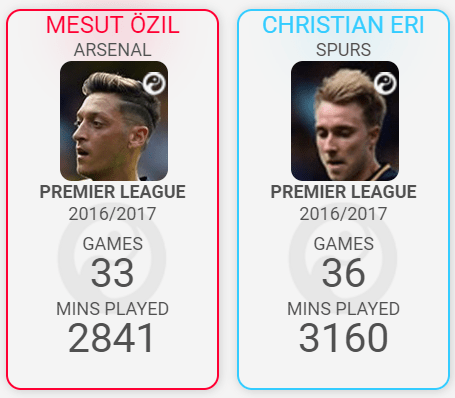 Eriksen is, evidently, more involved in attacking moves than Ozil. He appears to play with far more goal scoring intent — shown by his comparatively high number of shots. Is Eriksen’s shooting as accurate as Ozil’s? What range were their shots taken from? Is Eriksen’s style of play a reflection of Tottenham in general? How about Ozil’s style in relation to Arsenal? How instrumental were both players to their team’s attacking play compared with other team mates? You can dig deep using Squawka, and you’ll learn a lot in the process. The facts are there at your fingertips. Check out my analysis of the top teams from the 2016-17 season using Squawka. How Can Squawka Be Used For Football Betting? Squawka has many applications — such as Fantasy Football, researching statistics for articles/blogs/punditry, settling debates, and general fan interest. It wasn’t designed solely for sports betting purposes — so the data doesn’t come in an easy-to-use Excel format. It’s a useful tool for football betting because it enables recreational punters to learn more about the game as a whole, to disregard what they think, and instead base decisions around facts. Therefore it serves as a “sanity check” which helps to abolish many of the irrational views held by, typically biased, football fans. Essentially, Squawka’s a great starting point for research. By closely analysing players and teams you can begin to identify bias (and thereby value) in the betting markets. That’s one step towards creating a bet selection method, or football prediction model. For football, market inaccuracies are most common at the start of a new season when players and teams haven’t fully settled in. The public remains hung up on last season, the predictions from well-known pundits or journalists, hyped-up summer transfers and media noise, that bookmakers and the betting exchange fail to correctly price the odds. This period of uncertainty is where opportunities arise. Odds sharpen as the season progresses. Markets smarten up. It becomes increasingly difficult to find an edge in your bets. So be sure to utilise detailed analytics, such as those at Squawka, in pursuit of your advantage. Alternatively, subscribe to an already-proven value bet finder — such as Trademate Sport. Or follow a top Tipster as a basis for your bets. WhoScored — another Opta-powered site that provides many of the same visually-striking features as Squawka. Highly recommended. Understat — provides detailed Expected Goal statistics from previous fixtures. This revolutionary “xG” football metric allows you to evaluate team and player performances based on the likelihood of goals in a match. Footystats — includes some decent (but fairly basic) free football stats revealing the form of teams and players, as well as the timing/frequency of goals. The premium version unlocks more statistics and features — such as .csv exports, which are helpful for betting analysis. There’s many other free football stats databases out there — but most of them are affiliated with Bookmakers. If those sites were genuinely able to help you find value bets, then bookmakers wouldn’t partner with them, or allow them to advertise. So I’d stick to fully independent sites. It’s interesting to play around with football stats and analytics. Just remember that they’re only a guideline for what to expect in the future. Who Are The Best Football Vloggers?